The bottom would be a rice of some sort. Now, I was initially thinking along the lines of rice cooked in a tomato juice broth with achiote. But then, that would be awfully similar to the beans themselves. So, aha!!! Mango sticky rice! Next would be the black beans. Your follow-up layers could be a host of choices. A sautéed mixture of vegetables, a thick cashew cream, guacamole, salsa, vegan cheese. Top with vegan sour cream and cilantro. Be creative. Make extra beans. They freeze well. Puree them, and you have a great dip for crackers or veggies. Use them as a base for tacos, burritos, stuffed inside an empanada or tamale. Thin them out with a touch of chickenless broth and toss them with some pasta and mixed garden vegetables for a delightful and delicious entrée. Thin them out, add veggies, and you have black bean soup. Make them on Sunday and you can refashion them several times throughout the week so that you have a completely different dish with little to no effort. Soak Mulato chilies in hot water for 15 minutes, then puree and set pureed mixture aside. In large heavy-bottomed stock pot, sauté the onions in the olive oil on medium heat until they are slightly caramelized. Add the garlic, and continue sautéing until fragrant. Add all the ingredients, except the carob/chocolate chips. Bring to a boil, then reduce to a simmer. Stir at least once every 15 minutes. Cook for 3-4 hours, or until the black beans are soft. 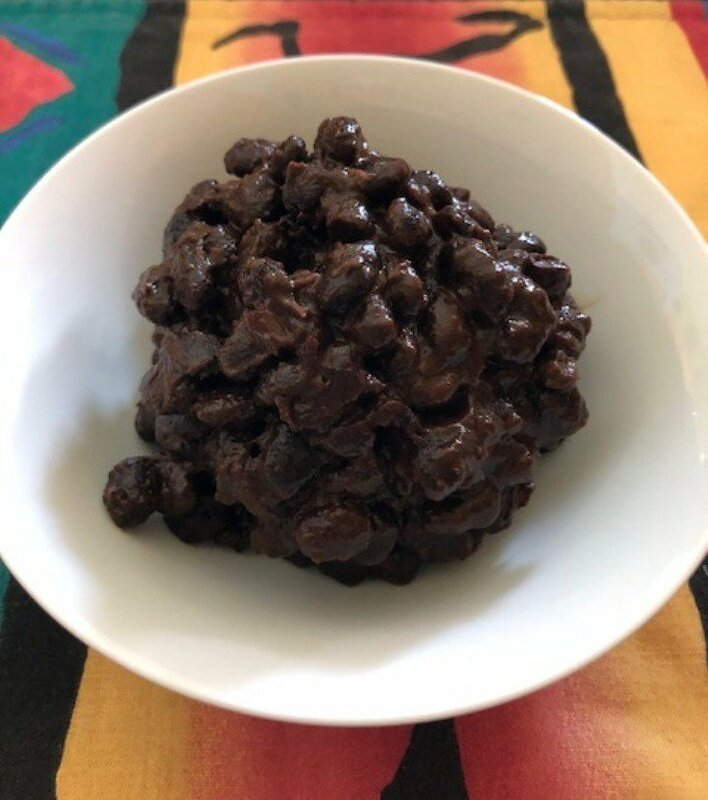 Note: Once the liquid becomes viscous from the starch in the beans, you may want to lower the heat slightly, but keep it simmering, and stir more often, to prevent sticking on the bottom of the pan. If the beans should stick to the bottom, do not stir. Pour the beans and liquid into another pot, being careful not to scrape the bottom, leaving the burnt bits in the first pot. Bring the new pot back to a simmer and continue simmering until done.